It is most def-in-ite-ly spring!!! But Hubby says we can't set the trampoline up yet because snow can still happen in April. I will most surely turn in to a cry baby if I see that stuff again. I'm excited to share the features this week!! I just love everyone's fabulousness! 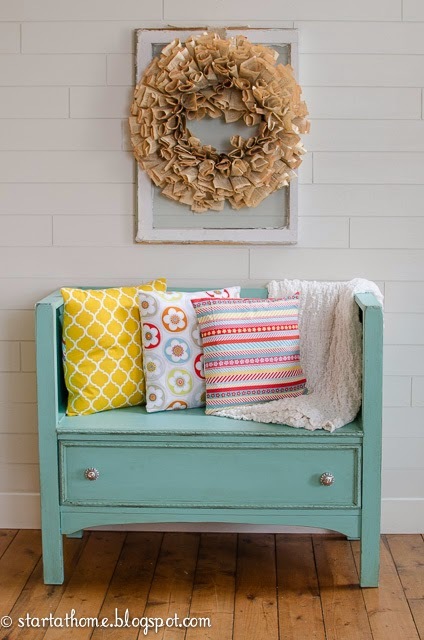 Start At Home made one of the cutest benches I've EVER seen - out of a nasty (and I do mean nasty) old dresser! I Can Find The Time wanted the light without the $1,698 price tag - so she made her own for $47.50! This is so clever! 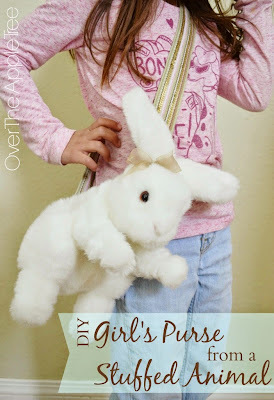 Over The Apple Tree took a stuffed animal and turned it into a purse! These are so popular right now for little girls. Nicer Than New changed the feel of her dining room from "Granny" to "Bright and Fresh". 3.Visit the link before you and leave a comment! Thanks Kammy for Trash 2 Treasure this week. Love the size of the thumbnails. Have a great week. I'm with you on being over the snow. Our garden has started sprouting perennials and I'm itching to get out there with the annuals. Soon. Hopefully soon. Really awesome features this week, Kammy! Thanks for hosting! Love your party and I feel very honoured to have my dining room makeover featured! I hope you had a wonderful and joyful Easter weekend. Kammy I came to link up and I was flattered you featured my Dresser Bench!! Thank you so much!!! Such beautiful features Kammy! Thanks for hosting! Thanks for hosting Kammy! Have a great day!